TYOFFROAD is a Trials Twinshock Restoration service for most twinshock trials bikes and specialising in Honda TLRs and Yamaha TY175. We also stock spares for Honda TLR, Yamaha TY and we are a dealer for Falcon Shock Aborbers. We are based in Staffordshire. 'Colin is very knowledgeable and enthusiastic, he diagnosed and sorted a tricky ignition fault on my TY175 quickly and gave me good advice on potential improvements I could make in future'. 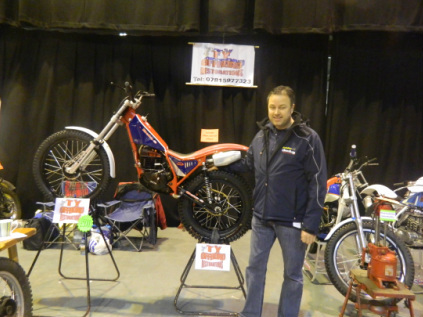 Trials bike parts and spares (Genuine Honda TLR RTL trials parts & Genuine Yamaha TY trials parts, also after-market trials parts available). If it is not listed please contact us, as we may have what you are looking for in stock. UK dealer for Falcon Shock Absorbers. Ok so why choose us? This is a bespoke Beta 240cc Twinshock built by TYOFFROAD team. "very much like a factory bike, I will be forwarding picture to the Beta Factory". Honda, Yamaha twinshock trials bikes. Any condition considered.